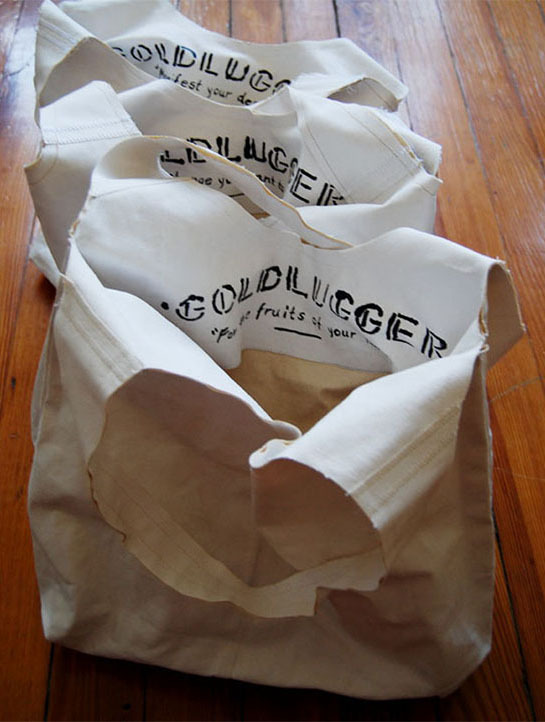 Goldlugger™ tote bags are “cut from the very cloth of Walliecamp”, a primed cotton canvas that references the trousers common to miners of the California Gold Rush (Levi Strauss’s original riveted trousers were made from white tent canvas.) Each Goldlugger is stenciled with the Goldlugger brand and inscribed with an original phrase that refers to the conflation of happiness, spiritual wellbeing and moneymaking in late capitalist America. Sample phrases include: “Carry the change you want to spend in the world”, “Never be a beast of burden”, “Manifest your destiny”, “Speculation rewarded." The Goldlugger Factory Freelance Work Party was an in-home factory employing 4 freelance workers at a time in the cutting, sewing and stenciling of Goldluggers. Workers were paid $1/hour (well above the global average wage for garment and accessory workers.) Payment was issued in the form of Sacajawea US Dollar coins. Poster advertizing the Goldlugger Factory Freelance Work Party. Documentation of the Goldlugger Factory Freelance Work Party held in San Francisco in 2013.